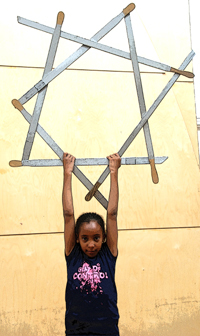 27 September 2010 - 28 February 2011 @ The Hub, 123 Star Lane, Canning Town, London E16 4PZ. 27 September 2011 - 5 December 2011 @ the English Folk Dance and Song Society, Cecil Sharp House, 2 Regent's Park Road, London NW1 7AY. Click here to view the animation Canning Town Trio, made for the English Folk Dance and Song Society to celebrate their centenary in 2011. This exhibition is dedicated to the memory of Daphne Green neé Cox (1928-1987), a lifelong member of and worker for the English Folk Dance and Song Society, & to the members of the Elsie J. Oxenham Appreciation Society. Welcome to the online version of the Canning Town Folk exhibition, first installed at The Hub in Canning Town from September 2010 to February 2011. The exhibition looks at the work of three remarkable women from the English folk dance movement: Maud Karpeles, Elsie J. Oxenham and Daisy Caroline Daking, and their links with Canning Town in East London between 1909 and the 1920s; along with the young Canning Town folk dancers of the same period and their extraordinary achievements. The exhibition was originally developed as part of Folk Formula, an East London Dance and Well London project inspired by Canning Town's history of folk dance. In summer 2010, East London Dance delivered new folk dance classes to under-16s, adults and parent/carer and toddlers groups at Ascot Hall, The Hub and the Keir Hardie Children's Centre in Canning Town, combining English folk dance with contemporary, African, Polish, Indian and Caribbean dance forms. All of the classes were inspired by the research carried out at the English Folk Dance and Song Society and the Newham Archives by lead artist Ju Gosling aka ju90 for this exhibition, with the current folk dancers of Canning Town dancing in the footsteps of the early twentieth-century dancers. 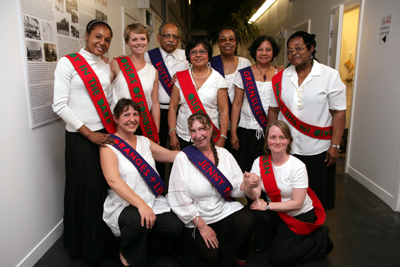 In October 2010, The Hub also hosted a conference about Canning Town's folk dance history. 6. Daisy Caroline Daking - 'the Pixie' - & the Plaistow Y.M.C.A.